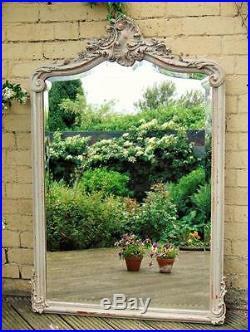 This is a very attractive French overmantel mirror dating from around 1880. 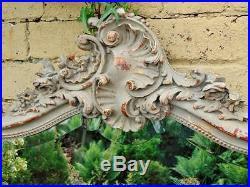 The substantial frame is beautifully embelished with flowers and scrolling acanthus detail. The mirror frame has a delightful French grey paint finish that has been attractively rubbed back revealing the gilded highlights and soft red oxide colours beneath. The large arched central mirror is the original bevelled mercury plate which has some spotting and characterful antiquating to the glass as per its age. 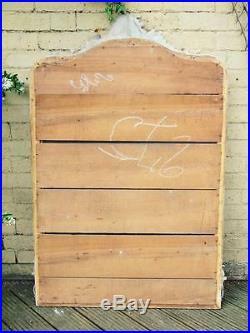 The mirror retains its original back boards. This substantial piece makes a great impact in any situation measuring 142 cms high by 92 cms wide at the extremities. Rams Head Antiques Wolsingham in Weardale. 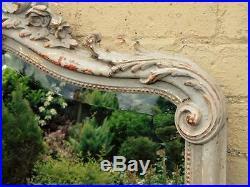 Beautiful French Painted Overmantel Mirror 19th Century. Please call me if you have any enquiries. Auctiva Offers Free Image Hosting and Editing. 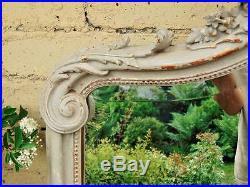 The item "Beautiful French Painted Overmantel Mirror 19th Century" is in sale since Monday, June 05, 2017.